Our new version is out and it comes with BIG improvements! With this update, we’re getting closer to fulfilling our promise of bringing job cost estimation, project management, scheduling, and real time actual vs. budget performance together in one place. It is now possible to do job cost estimation with job roles (ie, “this task will require 100 man hrs of Foreman time”). The term ‘Milestone’ has been replaced in the project plan; we now refer to ‘Phases’ (this is merely a change in name). You no longer have to schedule job phases or tasks during project plan creation. When you’re ready to build your plan schedule – for example, after your bid is accepted – click “Enable Scheduling” at the top right of the project plan interface. Scheduling at the resource level (person or equipment) can be handled directly through the project plan now. Additional (unscheduled) resources can be added to the list in Foreman’s view for timekeeping. Purchasing has been added to the mobile app (should be available on GooglePlay tomorrow, Apple AppStore within 10 business days). We have added significant additional infrastructure to the “Rates” section of the admin panel. We recommend that you check that section right away and make any updates you feel are necessary. We expect to push an update reintroducing overtime calculations in Knowify numbers soon. Check out a short video tutorial to learn more about these new features! What do you do when a customer calls for help? – Create a job ticket? – Determine who’s available to do the work? – Assign a ticket and get it to that available tech? – Where do you enter work order notes? – How do you alert your field person a new job is waiting? – Where does he/she record jobsite notes, track extra materials used, etc? Maybe you’re working off a spreadsheet? Or texting your field teams? Waiting until they get back to the office to hand you their paperwork at the end of their day or first thing in the morning? If you are, you’re not alone. 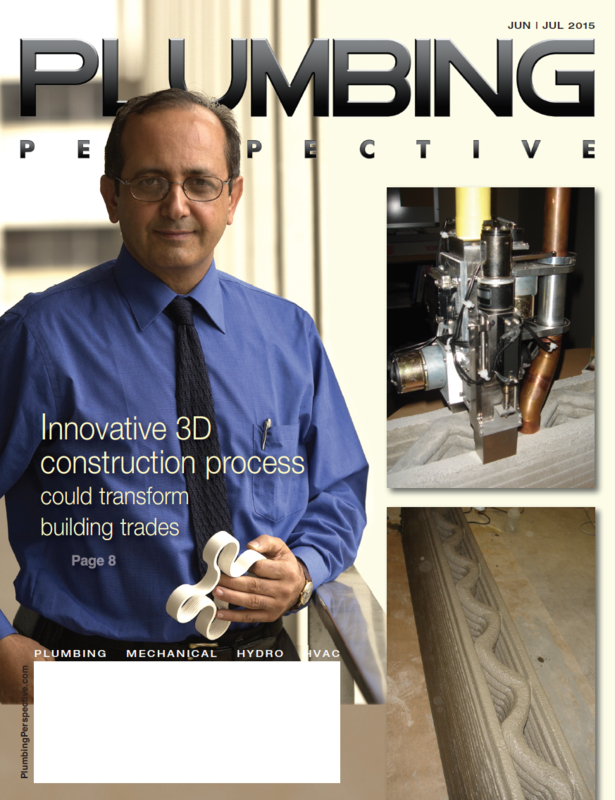 Lots of contractors rely on paper and pencil to run jobs. And they spend weekends at their computers plugging all that information into their Excel spreadsheets. A service call comes in from a customer. Your service manager goes to the “Dispatch Jobs” section of Knowify, and quickly creates a ticket for the client. He enters whether it’s a time-and-materials job or a pre-defined, fixed-price service. The manager looks at the schedule for all your technicians and assigns the job ticket to the available tech (or multiple techs, as necessary). He then adds the work order notes specifying what the client needs done, finishes the ticket, and clicks send. The tech is notified of the assigned work on any smartphone or tablet and sees the ticket added to his/her job list in Knowify’s mobile app. Click. Click. Smart. When your tech arrives at the jobsite, he clicks on Knowify’s GPS-enabled Check In to automatically record work time. The tech opens the job ticket to view the service notes and materials specified, and goes right to work. Done, your field tech records any jobsite notes, identifies additional materials used, and marks the ticket completed. The tech checks out, and the work time is recorded. 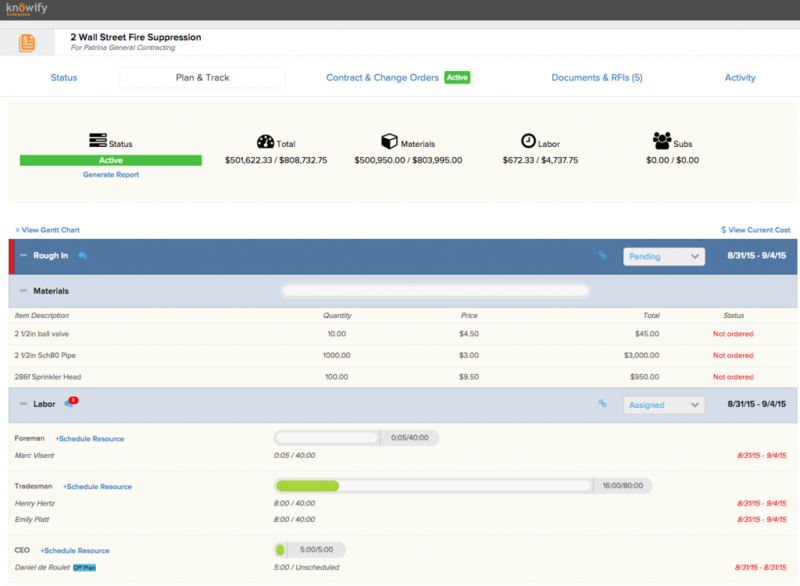 Back at the office, your service manager can immediately prepare an invoice for the job and close out the ticket. Try that with a pen, paper and QuickBooks® alone! Knowify is built for the real contracting world. It’s flexible, so you can address issues on the fly, as they occur — like pulling workers off jobs at a moment’s notice to handle an important or emergency service item. Or…you could keep running your business on Excel! I’d KILL for a system to manage my service ticket and contract work! 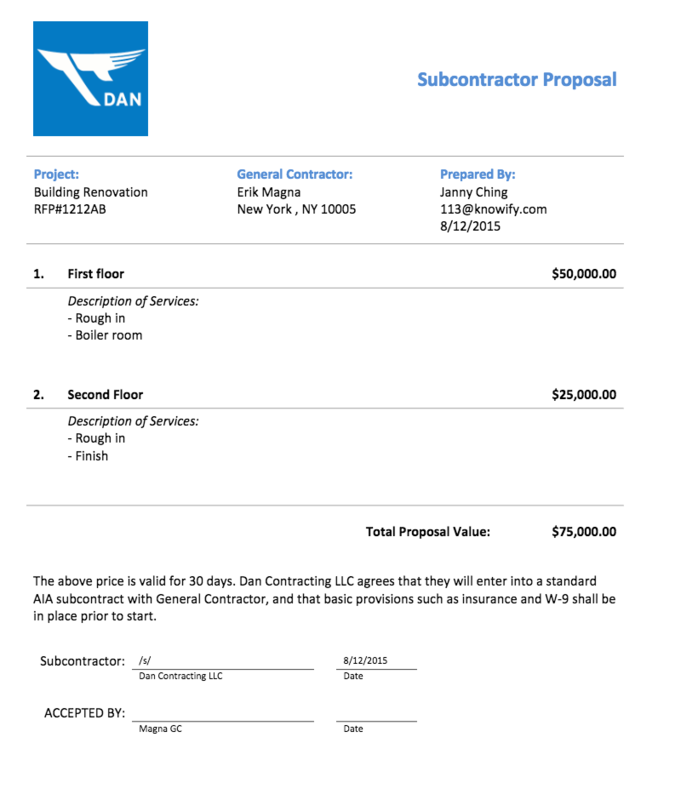 If you’re a contractor who performs service ticket and contract work (electrical, HVAC, plumbing contractors, etc. ), you’re probably struggling to find a system that helps you manage both aspects of your business. Sure, you’ve got QuickBooks®, but that doesn’t help you bid or manage projects, produce change orders and get them signed, schedule crews, etc. And most project management software is either really expensive or really clunky. Why, you ask yourself, can’t someone build a system (yep, on the “cloud”) you and your crews can access from anywhere that also provides clear visibility to office-side superintendents, service techs, and jobsite foremen? Knowify is the one-technology solution that delivers all the tools to run an efficient, profitable contracting business. 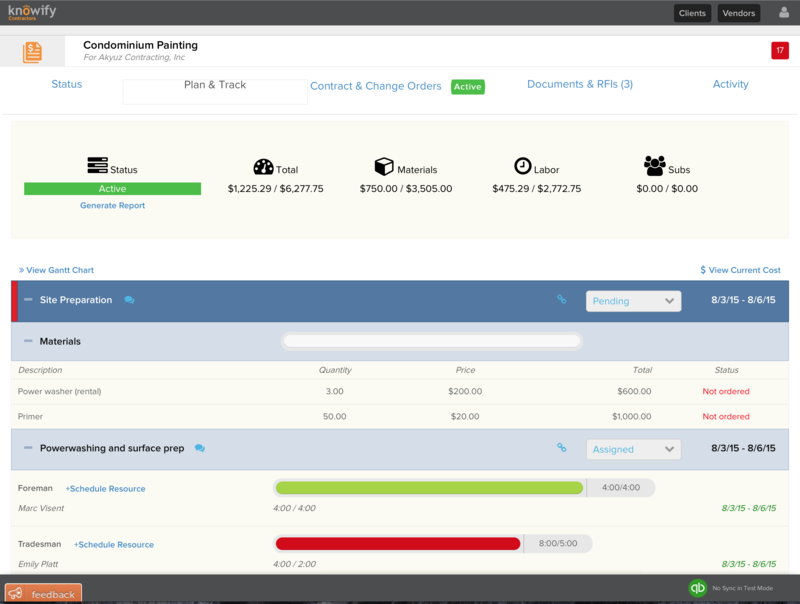 Imagine you could tap powerful project management, bidding, change order management, purchasing, and invoicing tools that helped you really manage your long-term project work and team dispatch. 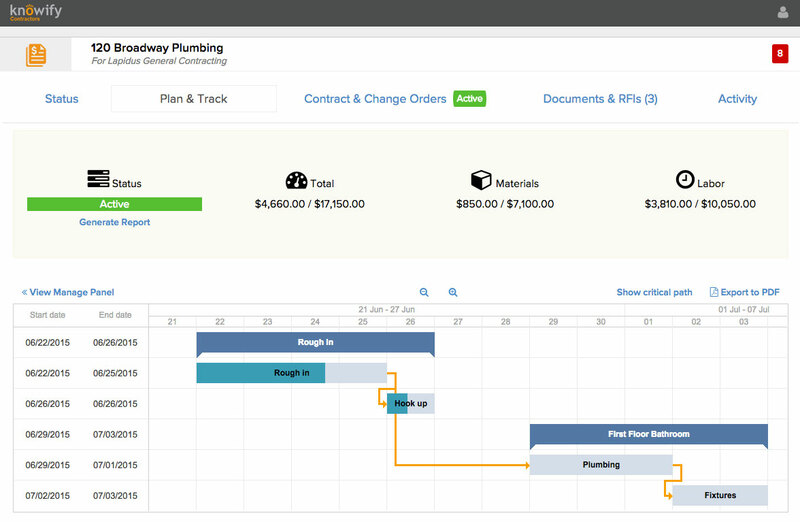 Knowify’s Resource Scheduler is built for the real contracting world. It’s flexible, so you can address issues on the fly, as they occur — like pulling workers off jobs at a moment’s notice to handle an important or emergency service item. Managing a medium or large sized construction project can be very stressful. Everybody on your team expects you to get the job done right with a limited budget and tight deadlines. 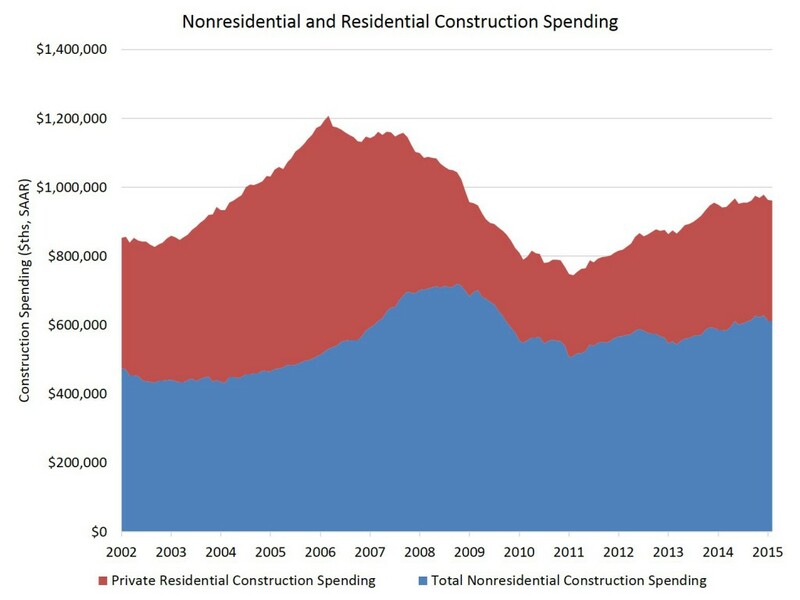 Being a construction superintendent or project managers usually involves a constant daily grind against the mounting administrative work, fighting to do more with less, and making critical project decisions with far-from perfect information. Thankfully, there are two great stress relievers that can help: 1) meditation, which has been proven to lower blood pressure; and 2) Knowify’s very powerful cloud based project management module. Knowify project management improves visibility in all phases of a project, from pre-bid budgeting to late-project punch list tracking. We’ve made it easy to see at-a-glance where you stand, with real-time updates as time card and purchasing data come in; we have also simplified field and office communication, with built-in mobile tools for foreman and other field staff to add their comments to the daily task logs. And with all of the other powerful tools in Knowify helping to easy painful administrative items like change orders, you’ll finally be able to sleep at night knowing that your projects are well in hand. If you’re a seasoned project manager, you’ll be pleased to know that Knowify includes all the project management tools you’re used to right out of the box, including dependency management, critical path scheduling, resource management, and Gantt Chart views. With Knowify’s Resource Scheduler only a click away, it’s easy to know how busy my team is and who is available to take on new task or project work. We know that once you’ve seen Knowify, you’ll realize that it’s a great solution for your construction business. The Knowify team is always available for training and support, and within only a short period of time you’ll discover the awesome efficiency that modern software can deliver to your business. And the more you know your business, the better able you’ll be to grow your business. It’s been already one month since we launched on Intuit’s app store for QuickBooks Online!